Apparently you're not open on Memorial Day so you can cancel my order. Tried to order dinner from here tonight. Received a call that you will not deliver to my home which is 3 miles away. Your representative was not polite and very short with me. I will not be ordering from you EVER again. I would much rather patronize an establishment who values their customers. Very poor business. We have lived in Wadsworth for 8 years. We tried that one Chinese place up by Drug Mart, when we first moved here, it was horrible. Tried New Style and we have never gone any place else. We always have good service and good food. They make it as you request , if you have a special order! 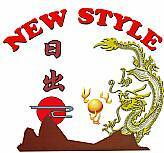 Love New Style Chinese! Thanks guys for making it good for 8+ years! My experience at this restaurant has been abysmal. Several week ago we placed an order and it was so salty it was uneatable. We called to make a point and they choose to debate it with us. Reluctantly they offered us a credit. Recently we thought we would give it another try. They wouldn't acknowledge the credit, but said someone would call. Well that didn't happen either. Terrible food and even worse service.